Silicosis is an occupational lung disease caused by inhalation, retention, and pulmonary reaction to crystalline silica. Mining, tunneling, sandstone industry, stone quarrying, working in foundries,  and drilling are the occupations closely related to hazardous exposure to silica. Despite knowledge about the disease, it is often unrecognized and under-reported. Hence its true prevalence is substantially underestimated. There are very few epidemiological studies of silicosis in India where the prevalence of silicosis varies from 3.5% in ordnance factories to 54.6% in the slate pencil industry. Regions in and around Coimbatore in the western part of Tamil Nadu has a huge unorganized sector of industries like foundries, stone crushing (silica flour mills),  and grinder stone polishing where thousands of people work with potential exposure to the silica dust. In this study, we tried to determine the number of silicosis cases diagnosed in a one-year period attending our outpatient facility with emphasis on the protective measures employed, awareness among the workers, and health screening for the workers. Coimbatore Medical College Hospital is a tertiary care centre. This is a passive surveillance of the patients diagnosed with silicosis in our outpatient department during a one-year period between January 1, 2012 and December 31, 2012. The following variables were studied: Age, gender, symptoms, occupational history including job description tuberculosis, history of smoking, physical examination, X- ray of the chest, high-resolution computed tomography (HRCT) of the lung, spirometry, sputum for acid-fast bacilli (AFB), electrocardiography (ECG), and pulse oximetry. In this series, we describe a total of 17 cases. The majority of patients (94%) were male with a mean age of 55 years. Average duration of exposure to silica among the patients was 22 years. The predominant symptom with which the patient presented is breathlessness [Table 1]. Various types of occupations in which the patients were employed are listed in [Table 2]. Analysis regarding primary prevention revealed that protective mask was used only by 29% of the patients, respirator by 5%, and plain cloth mask by 12%. Only one patient was aware about the risks involved in working in such occupations. Yearly screening in the form of physical examination only had been conducted in 12% of the patients. None of these patients was subjected to a chest X-ray or spirometry. All the patients were screened for sputum for AFB smear as per the guidelines of the Revised National Tuberculosis Control Program (RNTCP) and 12% of the patients had smear-positive pulmonary tuberculosis. History of previous treatment with antituberculous treatment was found in 47% of the patients; 59% of the patients were smokers. Pulmonary function tests were carried out according to the standardized reference equation of ATS/ERS (ATS: American Thoracic Society; ERS: European Respiratory Society) and it was found to be normal in 12% of the patients; obstructive pattern was seen in 29% of the patients and restriction in 59% of the patients. ECG and echocardiogram showed features of cor pulmonale in 12% of the patients. Radiological features are described in [Table 3]. The main findings in our study were as follows: (1) Low level of awareness, low usage of protective measures, and low implementation of screening procedures among the patients. (2) Foundry work and stone crushing were the main occupations seen. (3) Majority of the patients had complication of tuberculosis. (4) Most patients had restrictive lung disease. (5) Radiologically, a predominance of the upper zone was seen in majority of the cases [Figure 1],[Figure 2] and [Figure 3]. With regard to the prevalence of gender, our study had a higher number of male patients and only one was a female. 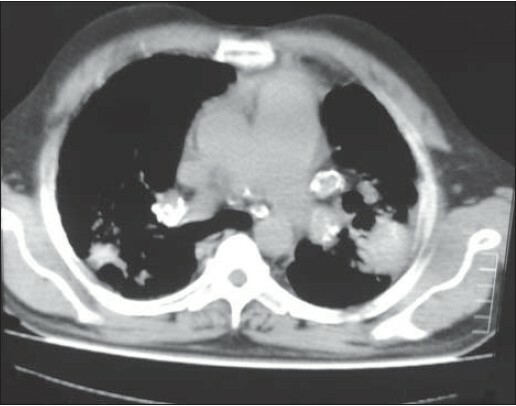 The main presentation of these patients was breathlessness and cough. These symptoms are nonspecific as most of the patients who are smokers would have had the same symptoms previously. This could have had an impact on the early diagnosis of silicosis among these patients. Most of the occupations described in our study like foundry work, drilling, and quarrying demand high physical strength and the same is reflected in our study with male predominance. The various occupations described in our study are region specific like foundry, stone crushing, and grinder stone work. Chronic exposure to silica predisposes to tuberculosis,  which is still a major health problem in developing countries like India. The susceptibility of silicotic workers to tuberculosis has been attributed to the toxic effect of silica on the pulmonary macrophages. In our case series, 12% of the patients had active pulmonary tuberculosis confirmed by sputum positivity and another 8 patients had previous treatment for tuberculosis in the past, thus confirming the increased risk of tuberculosis associated with silicosis. History of smoking has been documented in 59% of patients. Recently, crystalline silica has been classified as human carcinogen (group I) by the International Agency for Research on Cancer (IARC). Hence potentially, these silicosis patients who have a history of smoking are at a high risk for cancer in the future and need a close follow-up. 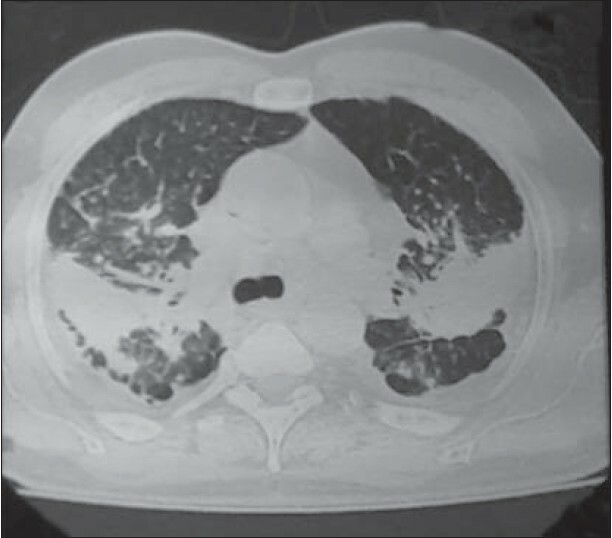 The radiological pattern is categorized using the international classification of radiographs of pneumoconiosis by the International Labour Organization (ILO) by size, shape, and profusion. In silicosis, rounded opacities type 'q' and'r' dominate. In our case series, a nodular pattern was found in 59% (n = 9) of patients. Other radiological patterns in our case series are listed in [Table 3]. Various studies to assess the abnormalities in lung function in silicosis have often been unable to distinguish between the effects of silicosis and possible independent effects of the dust on the spirometric changes. In our study, a restrictive pattern was seen in majority of the patients followed by an obstructive pattern. Also, most of our patients were smokers which could also be an independent risk factor for the abnormalities in lung function. Silicosis is not a curable disease; therefore, control of this disease lies mainly in prevention. In 1995, WHO and ILO began an awareness- and prevention-focused campaign to eliminate silicosis from the world by 2030. Many countries like China, Brazil, and so on, have implemented national projects within the global program. In India, a national program for silicosis is yet to be formulated. At present, industries with such occupations are covered by the Factories Act, 1948, the Mines Act, 1952, and the Building and Other Construction Workers Act, 1996. Policies of the acts are likely to be followed in the organized sectors, but the problem arises in the unorganized sector as in our study, where most of the patients were workers in the unorganized sector. The ignorance about silicosis has also been addressed on several occasions, in particular, the 2007 statement from the NHRC. The problem of silicosis - a preventable disease - is well highlighted in our case series of 17 patients who reported to our outpatient department during the one-year period. This passive surveillance discloses just the tip of the iceberg with about thousands of laborers being employed in the unorganized sector in this region with very low levels of awareness, low usage of protective measures, and low implementation of screening procedures. Hence, there is the need for formulating a countrywide strategy for prevention and control of silicosis in industrial populations. Recently, the state government of Tamil Nadu formed a district-level committee comprising health and industry officials in Coimbatore district to tackle silicosis exclusively. An active surveillance and medical examination has been planned by the committee. In our study, most of the patients were from the unorganised sector which does not fall under the Factories Act, 1948. These industries have a low level of control and preventive measures and low implementation of health screening. As silicosis is a preventable disease, a national program focusing on awareness and prevention of silicosis particularly involving this unorganized sector of industries has to be formulated at the earliest. 1. Elmes PC. Inorganic dusts. In: Raffle PA, Adams PH, Baxter PJ, Lee WR, editors. Hunter's diseases of occupation. 8 th ed. Boston, MA: Little, Brown, and Co.; 1994. 2. Singh SR. Concentration of free silica and heavy metals in respirable suspended particulate matter in small scale foundries in Chandigarh: India. Indian J Occupat Environ Med 2001;5:196-200. 4. Natarajan AS, Gajalakhsmi L, Karunakaran S. Accelerated silicosis in a silica flour mill worker. Lung India 1992;10:33-7. 5. Snider DE Jr. The relation between tuberculosis and silicosis. Am Rev Respir Dis 1978;118:455-60. 6. Monographs on the evaluation of carcinogenic risks to humans: Silica, some silicates, coal dust, and para-aramid fibrils. International Agency for research on Cancer. Lyon: World Health Organisation; 1997. p. 68. 7. International Labour Office: Guidelines for the use of the ILO International classification of radiographs of pneumoconiosis reved. 2000. Geneva: International Labour Organisation; 2002. 8. Bohadana AB, Peslin R, Poncelet B, Hannhart B. Lung mechanical properties in silicosis and anthrasilicosis. Scand J Environ Health 1985;11:101. 9. Saiyed HN. 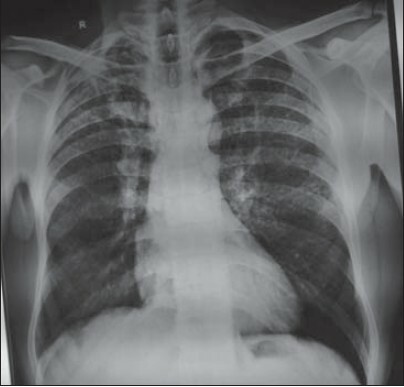 Silicosis: A challenge to industrial physicians. Indian J Ind Med 1994;40:50-5. 10. Panel formed to tackle silicosis in Coimbatore district The Hindu, Coimbatore ed. Dated 28 th December 2012.